Simple Spanish Rice. Super Tasty! and Bakeware Giveaway click here. Winner will be announced on Friday morning. Well my blog reading friends. I have a little question for you today. “I’ll be such a nice boy for the west of my whole wife! 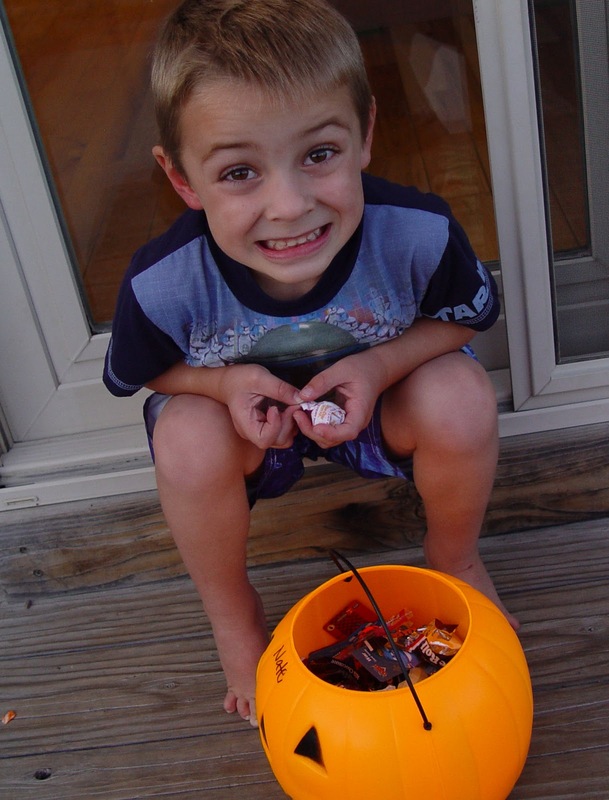 Just one more piece of candy, Mom. I’ve only had seven bajillion today so far. 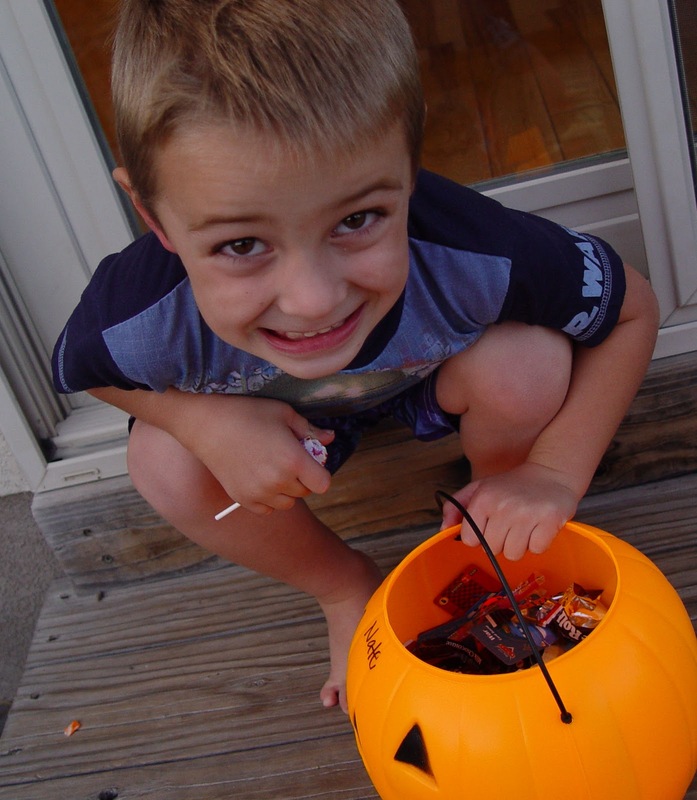 We (and I seriously mean “we”) cannot be trusted with so many pieces of candy lurking around, every where we turn. We (ok, mostly me…) do not do well left to our own devices. Please come and take them all! Every calorie laden, diet busting piece! Now, let’s talk about Spanish Rice. 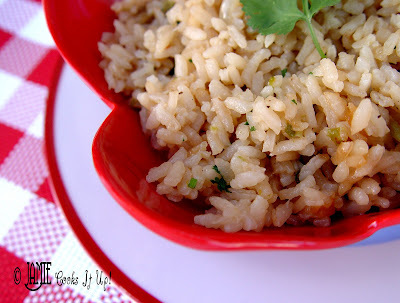 This flavorful, fabulously easy rice has no sugar added. It would be wonderful with the Burrito Casserole I posted earlier this week. Or with any Mexican Dish, for that matter. This delicious rice is made from scratch. The flavor is pretty mild, with just a little bit of a kick. it with a diced jalapeno pepper…. Last night I made it with just a pinch of red pepper flakes, and it really did the trick. Just enough kick to add some fun, with out all of the kid choking and eye watering. Now, you all know I love a good mix. I have a real affection for my handy dandy seasoning packets. But sometimes, there just aren’t any on the premises. I haven’t really missed her! Easy is something we can all appreciate, isn’t it? 1. 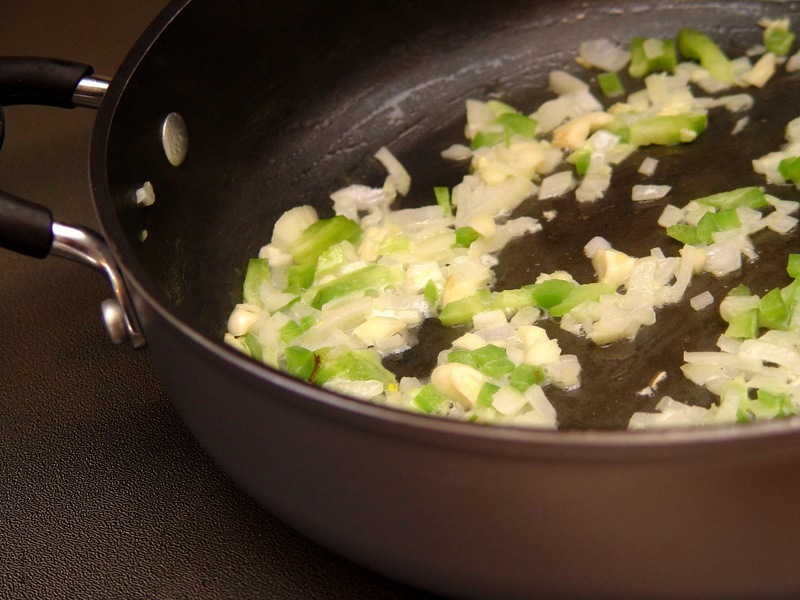 Heat up a large skillet and melt the 2 T butter. Throw those finely chopped veggies right on in. Season them with a bit of salt and pepper. 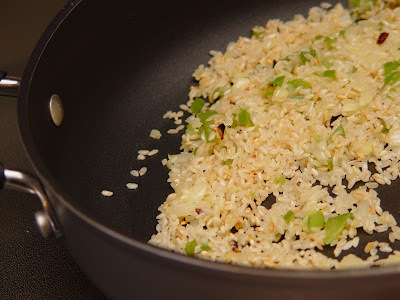 Add your red pepper flakes….careful here. They can add a lot of heat with just a bit, so add with caution. Let the veggies cook over medium high heat until the onions start to wilt. This should take about 5 minutes. 2. Add your rice. Let it cook in until it gets nice and golden brown. About another 5 minutes. You’ll want to stir it every minute or so, so it doesn’t burn to the bottom of the pan. 3. Pour in your water and beef bullion. Stir it all around. Let the mixture come to a boil. Cover the pan and turn the heat to medium low. Let it simmer away for about 15 minutes, or until the liquid has all been soaked up and the rice is tender. 4. Add 1 more T of butter. Stir it around to incorporate. Taste it and add more salt and pepper as needed. 5. If you have some cilantro, now is the time to chop it up and add it to the rice. Stir it all around and serve! 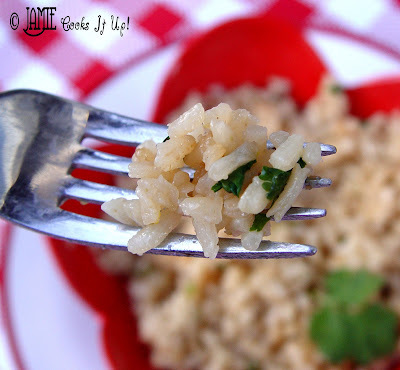 I'm sure any kid would give up their Halloween candy for this rice – it looks heavenly! I hate to admit this (I was such a substandard mother…), but after several years of “monitoring” my kids' candy intake post-Halloween – I did the unthinkable. I told them they had to have it completely eaten within the two days after Halloween. The first day they were ecstatic (literally!). By evening of that first day – they were turning green. Then the second day they were lining up at the garbage can to throw it all out. (I should have been reported for child abuse!) Good luck! I will have to try this recipe Jamie. I am still on the search for a good one. On the candy take out all the candy that could be used for baking and then put the rest on the front porch for “The Great Pumpkin” to take away. I have had to do that a time or two. 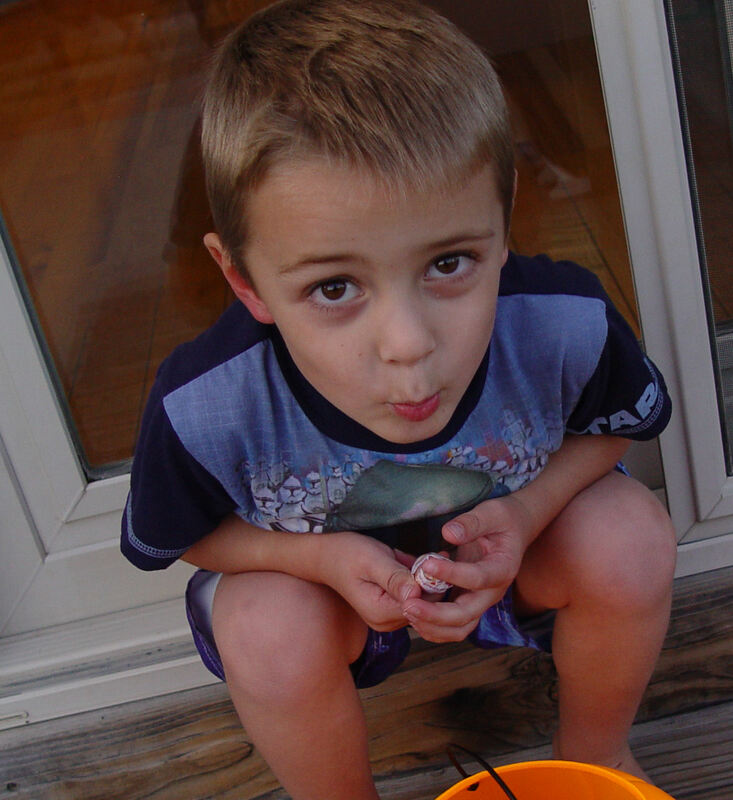 I love spanish rice… but I really love Halloween candy! 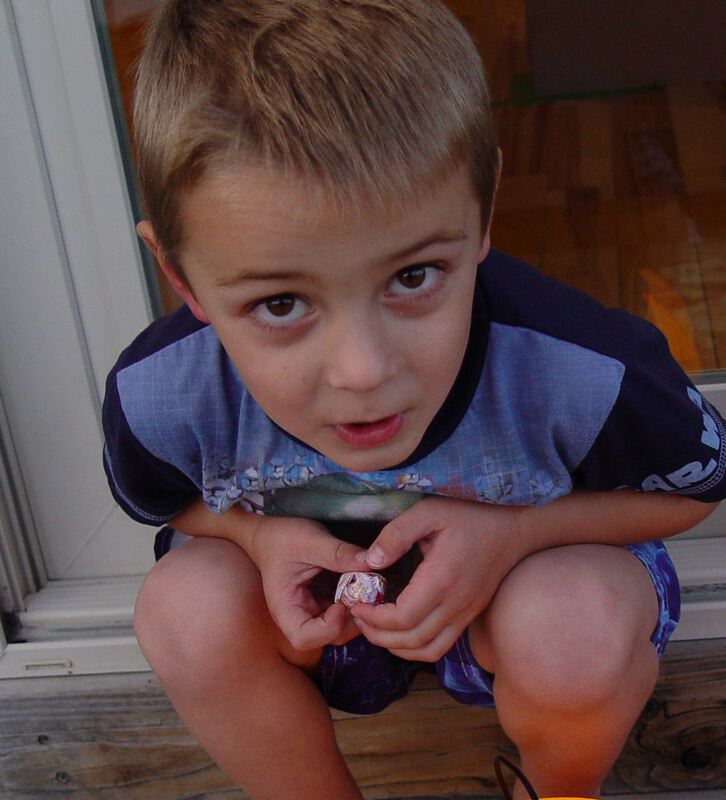 Oh my… I remember going through my childrens bags and picking stuff out. I don't care much for the “junk” candy (cheap hard candy and such) but I love the chocolates and gum! But – do you know what I find so very extremely annoying? I mean, this realllllllllly gets me every time I see it (and it's not just on your blog, so don't take this personally) – I mean, it really fries my bananas! I HATE (I hate that word) how people have to be so dang-out fancy by using the word “incorporate” instead of “stir well” or “mix well”. There. I said it, and I am pleased with myself, because it was hammered into me (HOW many years?) to be the peacemaker and keep things that bug me to myself. My counselor would be proud of me. Love your blog, by the way, I think I've said that countless times, I come here almost every day, and thank you for all the work you put into it, but one day, I'd be thrilled to pieces (don't count the pieces, please, there will be many!) if someone would write “Mix well”. we make spanish rice almost the same exact way except instead of water we do a mixture of tomato juice and chicken broth (more juice then broth), it gives it a really great flavor but it's not as pretty looking! I'll have to try the red pepper flakes, my husband loves jalapenos and anything super spicy the rest of us…not so much! This just might be the compromise we need! !